and Rail Spring Karkhana Sithouli. Currently Act Apprentice training will be available in the trades of Fitter, Welder (Gas & Electric), Mechanic Machine and Tool Maintenance, Machinist, Painter, Crane Operator, Electrician and COPA. Eligible candidates can submit their application form to NCR Allahabad Division on or before 17-12-2018. Candidates must have registered online @www.apprenticeship.gov.in website and registration number and copy should be attached with the application form. Selection for this Apprentices Recruitment of North Central Railway will be held based on merit in 10th and ITI qualifications. For more details regarding North Central Railway Act Apprentices ITI vacancies recruitment 2018 selection process available vacancies, how to apply online and more information is given below. 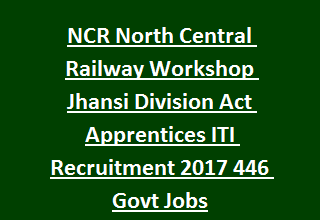 There are total 446 vacancies available in North Central Railway ITI Apprenticeship Program in Jhansi Division. For trade wise and division wise vacancies of Act Apprentices please see the official notification. Should have passed 10th Class with 50% of marks and ITI course in the relevant trade from a Industrial Training Institute which is approved by NCVT government recognized institute. As per the norms of Railway Board. Application Fee Rs.100 to be paid in the form of Bank DD in favor of Sr. DFM Jhansi and payable at Jhansi. Selection process will be based on candidates academic marks and in 10th class and average marks in ITI trade. Based on these a merit list will be prepared. Those candidates will be called for Apprentice Training. No Interview and No Exam For this training program joining. Eligible candidates can register first online for apprenticeship program@ www.apprenticeship.gov.in. And send the filled application form along with fee payment DD and other necessary documents to "Office of the Divisional Railway Manager Personnel Dept. (R&D Section) North Central Railway, Jhansi U.P. 284003 " through ordinary post or registered post only. Obtain a copy of application print with you for future usage. Last date to submit the application form online is 17-12-2018. On application cover must write "APPLICATION FOR ENGAGEMENT AS ACT APPRENTICE". For more details refer the below official website of North Central Railway, Allahabad. Hi Akash right now only for ITI Apprentice.